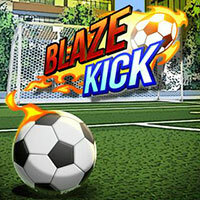 Blaze Kick: Train your free kick skills in this blazing soccer game and try to earn as many points as you can in 60 seconds! Wait for the perfect moment to shoot and aim for the target, it will give you bonus points and time. Level up to earn a power shot. Use it to burn through the wall and hit the multiplier to get a gigantic score boost! You can play this game on all devices. So enjoy and have fun in playing Blaze Kick Game on Round Games. Also make sure to check out Footstar Game, you may enjoy playing it.